Renowned slot developer IGT is at it again with a slot release that has come under the radar. It only seems like yesterday that we were reviewing the low-key Western Belles slot from the prolific developer and now they’re trying to squeeze another slot out on the sly. 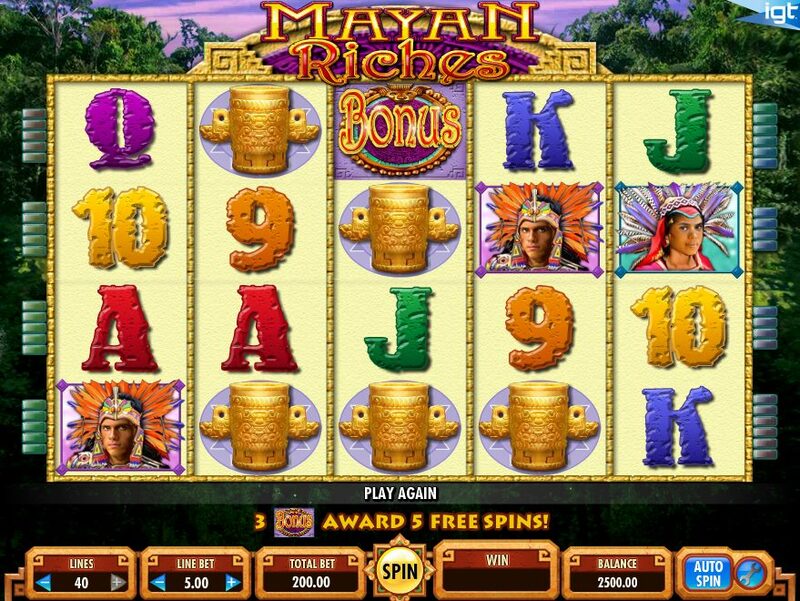 Mayan Riches is a 5 reel, 40 payline slot that by name could be mistaken for any generic Mayan-themed slot. You just need to have a quick glance around to see that there’s Mayan Treasures from Bally Technologies and you’re just scraping the surface. On this slot you can expect the stereotypes to appear on the reels. There’s the Mayan tribe male and the Mayan tribe female. There are also some Mayan sculptures and there is also the regular 9 through to Ace regular symbols that appear in a colored stone font. The Wild symbol is represented by a Mayan temple and this substitutes for all other symbols, except for the gold Bonus symbol, to help you complete winning combinations and win big prizes. 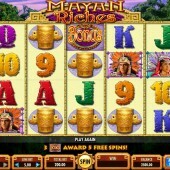 The Mayan temple Wild can also appear as a Stacked Wild opening up more opportunities for big wins across the reels. The gold Bonus symbol is the vital ingredient for triggering the free spins bonus round. If you hit three of these Bonus symbols on the three central reels then you will earn 5 free spins straight off the bat. That not might feel like many free spins for your efforts but there will be additional Stacked Wilds added to the reels during these free spins and the free spins can be re-triggered for you to earn up to 255 free spins. That is the be all and end all of Mayan Riches. It’s slots gaming at its most fundamental. It’s taken a generic genre and I have to be honest it has not really given me the wow factor. I felt that IGT had been on a roll with the releases of the sinister Black Widow slot and the Japanese-themed Jewel of the Arts slot but this is a step backwards… well, sideways at best. I am hoping for better from IGT next time. Unless you have a bizarre fetish for Stacked Wilds and uncreative bonus features then you might as well skip this one.